The First Youth Olympic Games is being held in Singapore from 14th to 26th August, 2010. 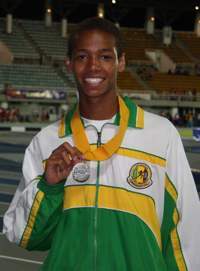 St. Vincent and the Grenadines is being represented in two (2) disciplines, Athletics and Taekwondo. The delegation leaves the State Tuesday 10th August and consists of the following persons. St Vincent and the Grenadines faltered badly at the recently concluded Central American and Caribbean (CAC) Games in the western city of Mayaguez, Puerto Rico, in a year when national representative teams seem to have a rather difficult time achieving success on the regional and international scene. Some time ago there was a serious conflict that arose in netball here. The issue related to whether students should be able to represent their clubs ahead of their schools in the national competition. Team Athletics St Vincent and the Grenadines (TASVG) launched its 10th anniversary edition of the annual Inter Financial Institutions Sports Day on Tuesday 13 April 2010 with a brief media ceremony at Olympic House. President of TASVG, Keith Joseph, proudly explained the success of the initiative taken 10 years ago to bring the nation's financial institutions together in friendly, fun-filled rivalry in a family-like atmosphere. He noted that this year's event which reverts to the Arnos Vale Playing Field on 15 May 2010 beginning at 1:30pm, will probably the biggest and most festive yet with a number of institutions coming on board for the very first time joining the other stalwarts. Vincentian athletes at the 39th edition of the Carifta Games held in Georgetown, Grand Cayman, Cayman Islands, 3 – 5 April 2010, fared as well as could be expected given the current state of the facilities here at home and the inadequacy of competitive action with people of a higher standard. That is the view of the leadership of Team Athletics St Vincent and the Grenadines. Vincentian athlete and Carifta silver medallist, Delohnni Nicol-Samuel, the son of Dane Samuel and nephew of Bigna Samuel, will not be wearing Vincentian colours at this year's Carifta Games. Selected by Team Athletics SVG in a quest for gold at what would be his final year of eligibility for Carifta, Delhonni has been refused permission to compete by his school, Campbell University, where he is a fist year student. We are in the midst of what is usually seen as the track and field season in athletics. Everywhere schools, primary and secondary, are holding their respective annual athletics competitions. On 18 March there will be the Heats for the girls for the Inter Secondary Track and Field Championships 2010. On that same day the boys will contest the 5000m Open. The following day, 19 March, it will be the turn of the boys to have their Heats and the girls will contest the finals of the 3000m Open. The Inter Secondary School Track and Field Championships Finals are set for 25 March. All of the foregoing competitions are being held at the Arnos Vale # 1 Playing Field. The proud tradition of distance running in the Samuel family of Sion Hill continues in track and field athletics in St Vincent and the Grenadines. This time around it is the turn of Delhonni Samuel, son of former marathoner, Dane Samuel, nowmarried and resident in Canada and the nephew of former national champion in everything from 800m through to the marathon, Bigna Samuel.